After three long and painful weeks of renovations, Mamak is open again for business. I don't often head to Mamak these days, turned off by the huge queues every evening (is Mamak the new old Spice I Am?) but it's funny how a little bit of reverse psychology works its magic. Closed and unavailable? I want it now. 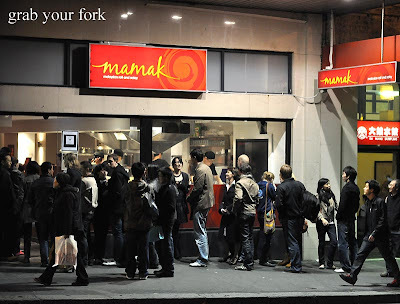 We headed to Mamak last Friday, its third day of business since its re-opening on Wednesday. Mindful of the imminent crowds, Suze, Simon and I meet outside at 5.45pm, our planned guarantee of getting a table immediately. A shift in kitchen set-up and a re-orientation of tables and chairs means the seating capacity has now effectively doubled. In spite of this, by 6.02pm, Mamak is full. Our drinks arrive not long after we order them. 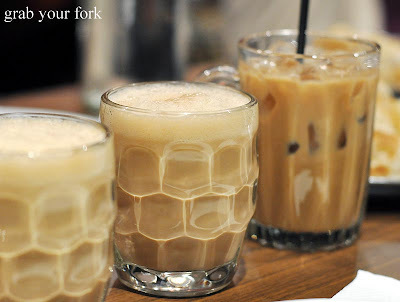 I stick with my favourite teh halia, the frothed and strong milky tea that has the added warmth of ginger. 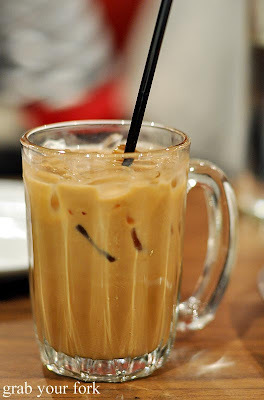 Simon has the traditional teh tarik stretched tea, whilst Suze goes for her favourite half coffee/half tea concoction. Though I like to call cham Suze's "crazy drink", the version here is suprisingly drinkable. 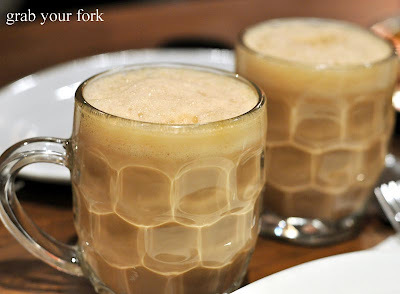 It tastes like a milky diluted coffee or a smoky tea that is cold and super sweet. The live roti action out the front whet the appetite for the roti that is to come. 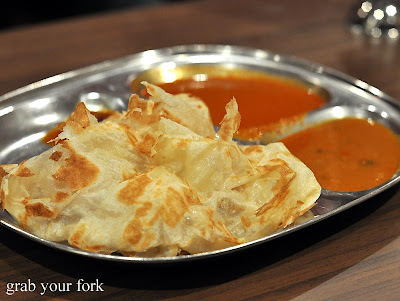 We order two serves of the roti canai, the roti thin and crispy and clumped into a fluffy cloud. 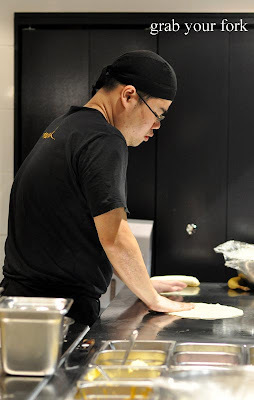 It's all finger action here and we tear the roti off in strips, to be doused liberally in curry sauce and fiery sambal. The lamb murtabak is as omelette-like as on previous encounters, and hence disappointing. I'm pleased when Suze reassures me that the filling in murtabak should be wetter, meatier and more curry like, than the solid omelette version here. 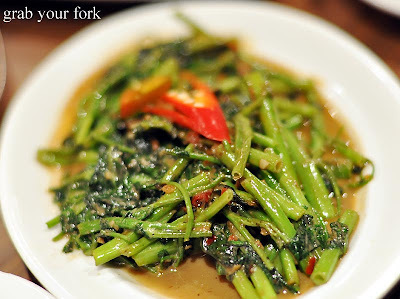 I'm pleased to taste a fair amount of belacan in the kangkung, the shrimp paste which even Poh described on last night's MasterChef Australia as "funky". There's plenty of heat too amongst the salty fishiness although I'm pining for a touch more sugar to give it better balance. On the multi-offering plate of nasi lemak, it's funny that the roasted peanuts and crunchy ikan bilis fried anchovies, are the first things we all go for. Two generous chunks of mackerel smothered in curry sauce are rich and oily in texture. The coconut rice is rich on the palate and on the tongue with coconut milk. Sambal prawns are a highlight, swathed in a sweet and spicy sambal, although at two dollars each they should be savoured slowly. 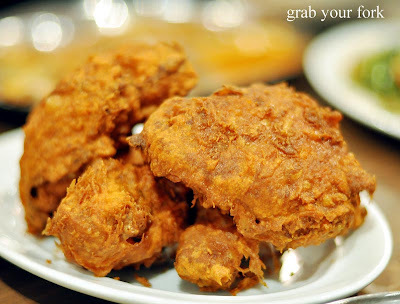 Our ayam goreng fried chicken arrives following a good fifteen minute lag in dishes. I notice too, that the table next to us have to chase down their roti which arrives as they finishing their meal. The fried chicken has a odd orange hue but the skin has plenty of crunch. Suze and Simon report that the chicken legs are disappointingly dry. I'd cleverly gone for the thigh and suffer no such problems. Dessert? With Suze around, that's definitely a rhetorical question. Despite Suze's hopeful plea for extra kaya, we find there's not much of the sweet pandan-flavoured coconut jam within our roti kaya. It's barely discernible outside of a rectangle within the very centre. The roti tisu, on the other hand, is all kinds of joy. There's something so majestic yet playful about its impressive stature, and it creates a pitter patter of excitement every time I see one head past our table. Suze calls this her "party hat" and because she's never averse to a photo opp, she dispatches me with camera to capture her "wearing her party hat" at the table. 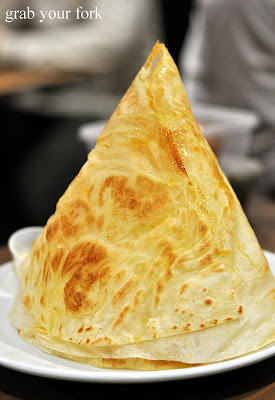 As the plate bearing a roti tisu makes the slow ascent toward the top of her head, patrons behind us turn their heads, bemused by the spectacle of a roti tisu spaceship magically levitating. 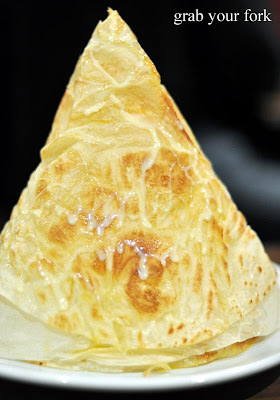 On the menu, the roti tisu is usually served with ice cream, but as Suze advises, it's best to order it the Malaysian way and ask for condensed milk instead. 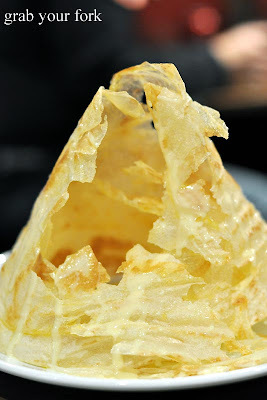 We annoint the roti tisu mountain, the condensed milk running down in little rivulets like melting snow down the alps. Oh it's good. Suze and I are in heaven, the thin tiles of sugar-glazed roti crunching in our mouths with the sweet creaminess of condensed milk. We relinquish our table to the growing masses outside, pausing by the kitchen for another viewing of the roti live performance. It's mesmerising, awe-inspiring, and somehow making me hungry all over again. 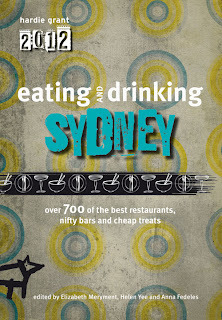 This has been included on Grab Your Fork's Top 10 Sydney Eats for Tourists. 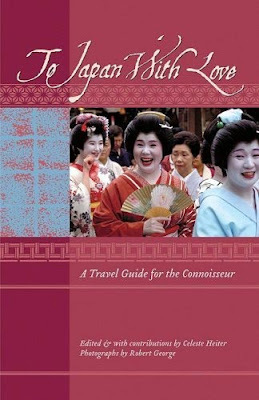 Read the entire list here. Haha I was exactly the same, I haven't been in ages because of the queues but when I heard it was closed I suddenly could think of nothing but eating their roti. 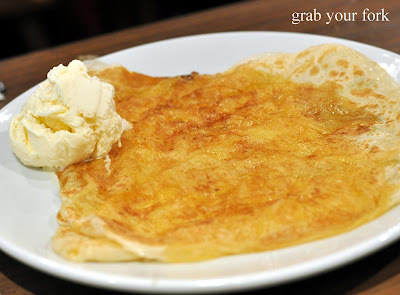 Getting condensed milk instead of ice cream with roti tisu makes it just that much better don't you think? Yeah! Mamak is back! It's cruel to look at all my faovurite food on your post and not able to taste them. Love to start my day with reading a great post like this! The odd orange hue on ayam goreng....... from malaysian curry powder? hehe.. some of the malaysian meat curry powder is orange, not yellow. Oh this is fabulous, fabulous timing! I am parking my bum outside their doors at 5.45pm on Friday before heading to the cinemas for HP! My precious roti, here I come! Ooh, i'm drooling at the pics! Can't wait to try it out, thanks for the post - now i'll know what to try and what to avoid! Ahhh yes!! Mamak is baaaack!! And I'm soo bummed that I couldn't come with you guys! That's a pretty long queue - apparently they were missed by many people eh? well come back Mamak! Great pics of the twirling, my poor camera couldn't handle it..
Mmm. That roti tisu sounds delicious! Will have to get down there early and beat the dinner crowd rush! 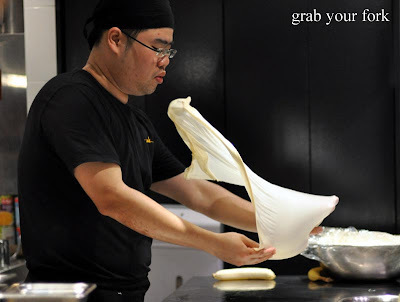 $9 for a roti tisu?? heartbreaking. 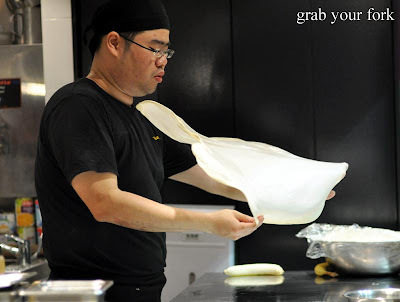 i really don't think the chinese uni students manning the roti here do as good a job as the indian mamaks back home. 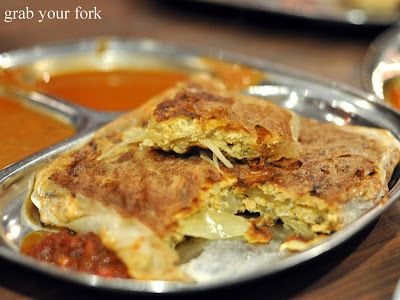 my pre-renovation experience of the murtabak was a flaccid, sodden, and above all, bland, affair. sob. good to hear Mamak is back although the only thing I've really enjoyed eating there is their roti. I'm drooling over all of the food! the chicken looks soo crunchy almost like kFC yumMm. lol it was nice bumping into you lot. The bf was like "OH thats grab your fork and thats chocolatesuze". How good is the ROTIIIIIIIII OMGGGGGGGG.. So how has Mamak changed? is it bigger? OH you missed the best part SATAY STICKS!! it is a pity the crowds are so big. Yes, get there early. The roti is the best I have had in Sydney. It should be called Roti Heaven. they should really take bookings???? if ppl dont make it to a booking on time (strict time) then give the table away? Hooorayy, time to queue for rojak and roti tisu again, yumyum! I have Malay friends who want to kill me when I mention the roti... apparently we're paying too much but for that roti canai - it's worth it! that queue still looks huge! Haven't set foot at Mamak as yet. Meanwhile, loving the satay, rojak pasembor and penang laksa at Abang Sam in Kensington. Look at that queue! I love the party hat pancake, and served with condensed milk sounds lovely. Hi Stephcookie - Oh condensed milk is such a revelation. I don't know why ice cream is even on the menu! And yes, I'm a total sucker when it comes to reverse psychology! Hi Ellie - Good thought on the Malaysian curry powder. I guess I was expecting a more KFC brown. lol. 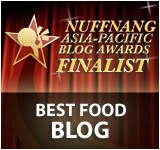 And yes, no better breakfast than a food blog post aye? Hi Trisha - Ooh enjoy your Mamak dinner. It opens at 5.30pm so don't be afraid to get there even earlier! Hi Betty - You have to have the satay too. We meant to order it but then forget, although just as well because we ordered one dish too many as it was! Hi Yas - Did you make it to Mamak the other night? Shame you couldn't make it, but hey, the queue just go crazy from 7pm and I hate waiting, hungry, for food. lol! Hi Chris - The roti tossing is such a joy to watch isn't it? And ha, you should've just turned your flash on. Don't worry too much about blinding them. lol. 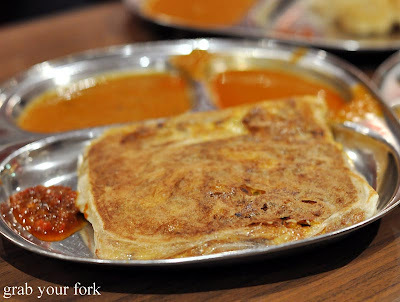 Hi Forager - The roti tisu is so good. I must time my dinners so I can make it to Mamak when it quietens down so I can have dessert! Hi Bowb - I'm sure everything is cheaper in Malaysia. Must go sometime! I want the real deal! Hi Simon Food Favourites - I think the roti is definitely the drawcard for Mamak. Their satay is quite good too. Hi Leona - It was quite funny to bump into you and your bf. I hope he has been placated that you really are quite tame compared to the spectacle of three SLRs and countless photos at our table! Hi Einna - No problem. Make sure you go early or be prepared to queue! Hi Sam - Ahh you must've made it back there by now? Hope you had fun! Hi sydneyguyrojoe - There's definitely more seating. I think almost double? And I know, we meant to order satay sticks but forget but then perhaps just as well because we over-ordered by one dish although it did mean I got a tasty dinner of leftovers to take home! Hi Yewenyi - Roti Heaven? lol. Hi Betty - Yup that was the line. I guess "no booking" policies are painful, but as long as people are prepared to queue I don't think Mamak would change? I'm not a big fan of queueing either, so yes go early or pick days earlier in the week. Hi YaYa - Time to queue alright. So great to see so much excitement too! Hi Tina - Haha, I'm sure prices are higher here, but then so are wages! lol. Hi Panda - The queue was insane. And nothing like being inside and watching the growing queue to make your roti taste even better? lol. Hi Billy - I remember trying cham in HK and being totally weird out by it. Maybe I will have to work on liking it. lol. And argh, so jealous! Hi Minh - I saw that Howard was there the other night for dessert! Hmmm... now I'm craving another one myself! Nice to know that there is more freshly-made roti around. Here in Melbourne there are a few places that make it fresh, but still most places are using pre-packaged stuff, even in restaurants which claim to be Malaysian/Indian and therefore should really do better. Just came back from Malaysia and am fiending like a junkie for a good roti chanai. 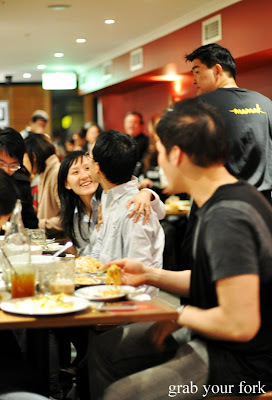 Hi Eurasian Sensation - There's certainly an element of theatre with the roti made fresh on the premises, although I can understand that with our high labour costs, it's why it is so rare in Australia. 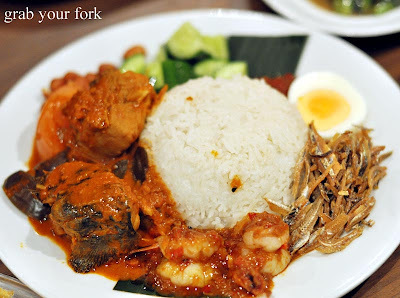 Would love to go to Malaysia sometime - so many eats I would love to find! 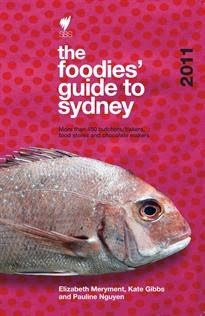 I am heading to Sydney soon and this is God sent! Just looking at the photos make me drool, imagine what will happen when I am seeing the real thing??? Mamak - here I come! Any suggestions for good Asian grocery shopping in the city? 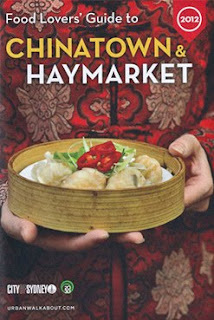 Hi Shagen - Chinatown is just down the road from the main CBD, in fact Mamak is at its doorstep. There are a few Asian grocery stores along Sussex St but for the biggest variety, I'd go to Thai Kee in Market City (above Paddy's Markets). Well worth the wait to get in (as long as you get there early to limit it - like you did) - we'd kill for their roti!